As I approached Federation Square on Saturday 4 April, I was first met with chants of “Aussie! Aussie! Aussie! Oi! Oi! Oi!” followed by “No room for racism!”, the latter much louder and uniform than the former. 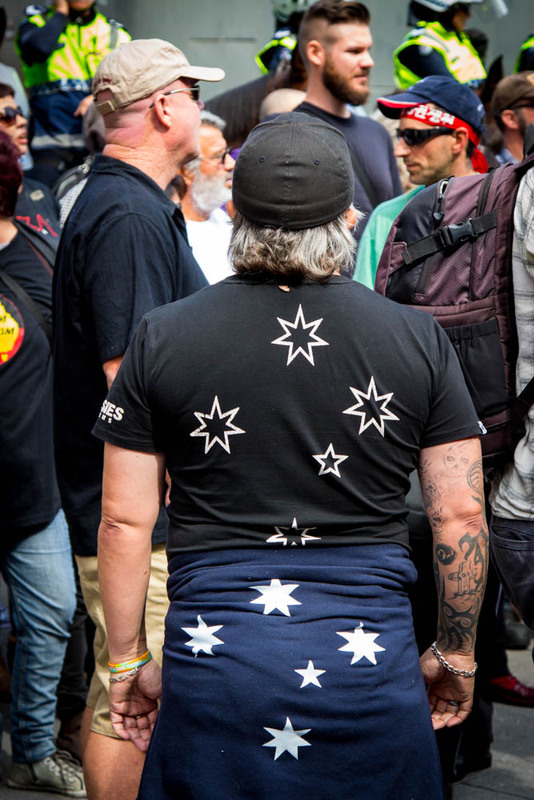 Australian flags, a variety of slogan-emblazoned t-shirts, swastikas, Australiana tattoos and signs taken from the Reclaim Australia website were to one side; pre-made banners, megaphones, and both homemade and downloaded placards the other. 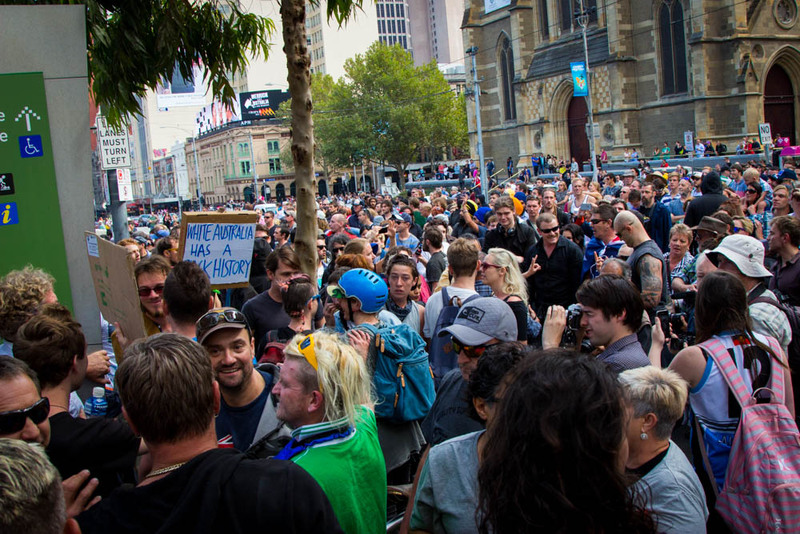 Both parties were there to fight opposing causes, separated by police on horseback and on foot, with each “side” congregating in the hundreds, maybe even thousands, at Federation Square. Despite these differences, both sides had attended to exercise one common purpose: freedom of speech. 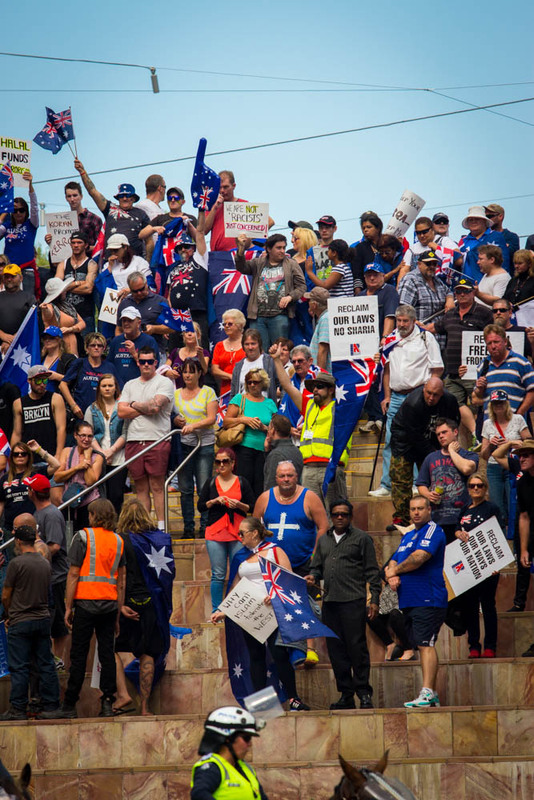 Those fighting for the so-called “Reclamation of Australia” had gathered in protest against Australia being “taken over” by sharia law and certification of Halal foods. 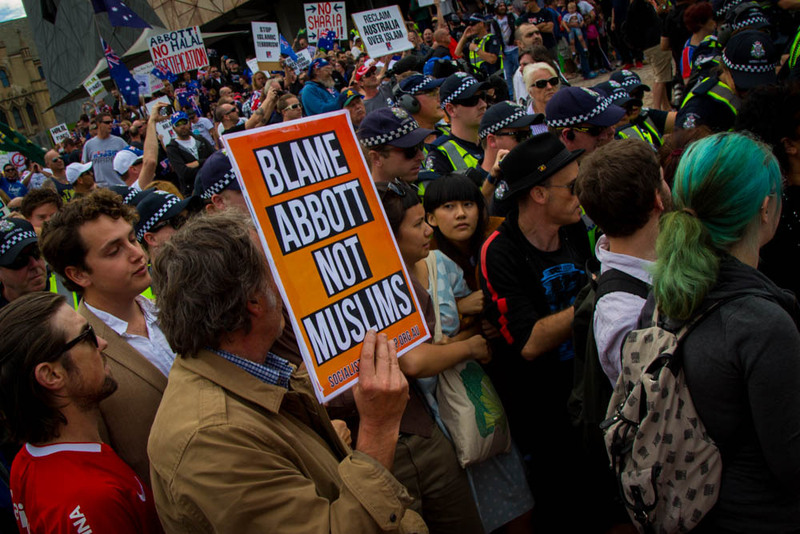 The counter-protesters, who far outnumbered Reclaim Australia, had gathered to speak out against racism and Islamophobia. Numbers grew as the day wore on, and tensions rose, with numerous physical altercations occurring, leading to the involvement of police and paramedics. Calls from fellow protesters — “It’s not worth it! It’s sending the wrong message!” — were unheeded, broken up only by security and police, and promptly filmed by news crews and individuals with cameras. 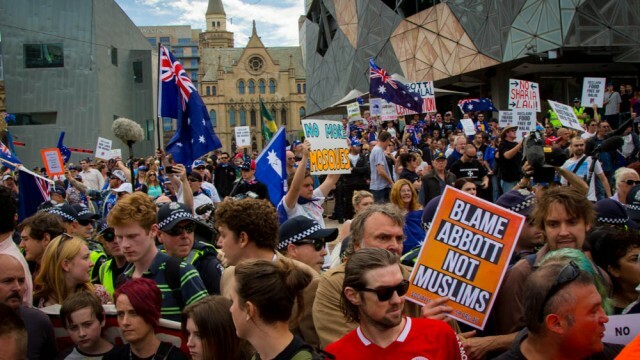 Most remarkable was the number of children in attendance who had arrived in the company of their guardians in the Reclaim Australia camp, most looking uncomfortable and confused, although some proudly waved banners and shouted chants. Witnessing such was extremely sobering in terms of the kind of world in which we are raising our children. Do we teach them tolerance? Or do we teach them hatred? The huge number of counter-protesters may serve as a sign for the future of Australia — throwing out stereotypical imagery of us being racist and generally intolerant, and showing future generations that Australia would be nowhere near as rich without the wonderful tapestry of cultures and individuals. Platitude by comparison is hindering. That, according to your observations, we are “doing better than* Europe” in a global sense does not make the need to protest and reduce Islamophpbic attitudes less pressing. I hope I’m reading your good sentiment, but suggesting that giving acts of hate against Muslims a label somehow detracts from awareness is flawed, while I agree that xenophobia is apt enough, the media need their buzz-words to frame issues and give them effective exposure. We are still doing better then Europe when it comes to embracing the muslim community lets face facts. Also I think that islamophobia is media coined term and a way to distract from the horrendous crimes we are being passive about.